RESERVE RENTALS NOW CALL 800-678-2341 ! Ski-in, Ski-out to Nub’s Nob, home of the Mid-West’s best snow…stay and ski from Hamlet Village Resort Condominiums. Call Land Masters/Hamlet Village Condominiums at 800-678-2341 for details. MIDWEEK 5 NIGHT SPECIALS – 5 Nights, Sunday thru Thursday, (excepting Holidays), enjoy SKI IN, SKI OUT access to downhill and x-c skiing. 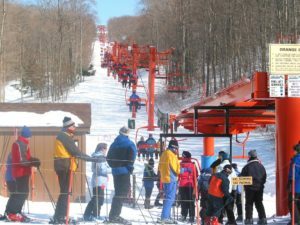 Discount coupons available for our guests for Skiing and Boarding on the 53 slopes plus terrain parks at “Nubs Nob”, home of the Mid-West’s best snow (Boyne Highlands 1/2 mile). Ski home to enjoy special times by the fireplace. Visit on-site Hamlet Club to enjoy the indoor pool, whirlpool and sauna. Mardi Gras at Nub’s Nob, their annual family orientated March Spring Fling with fun and games for all will be back again in March 2019. Plan ahead…Don’t miss the fun… the Soaker Cup, Costume contest, Crazy Couples, Dorie Sarns Open races with the Petoskey Steel Drum Band on the deck! Additional mid-week savings available during March. Dec. 15,16,17- United States Ski Association Mid AM and region 3 race on Scarface. Open to all qualified USSA members. Contact Cathy Janowiak at (231) 510-5455. Dec. 26 – Holiday Night Skiing & Riding begins and runs from 6 to 10 PM with the exception of New Year’s Eve thru January 5th, 2019. We begin our regular night skiing schedule on Monday, January 7th. Dec. 28 – Enjoy entertainer Patrick Ryan in Nub’s Pub from 3 to 6 PM. Jan. 7 – Nub’s Nob Alpine Racing (NNR) Weekday Night Training begins on Scarface and runs every Monday and Wednesday night from 6:30 to 8 PM through March 8th. Call NNR at 800-SKI-NUBS for more details. Jan. 7 – Nub’s Nob Junior Alpine Racing Team (JART) Monday night training sessions start and run Mondays and Wednesdays through February 28, 2018. 6 – 7:30 PM ages 5-14. Call the Winter Sports School at 800-SKI-NUBS for more details. Jan. 9 – Petoskey High School Ski Team BNC Conference ski meet begins at noon on Smokey and Scarface. Jan. 9 – Nub’s Nob Ski Academy Wednesday night sessions start and run through February 21, 2018. 6:00 – 8:00 PM ages 6-14. Call the Winter Sports School at 800-SKI-NUBS for more details. Jan 11. – Harbor Springs High School Ski Team ski meet begins at 5 PM on Smokey and Valley. Jan. 11 – Nub’s Nob Ski Academy Friday night sessions start and run through February 24, 2016. 6:00 – 8:00 PM ages 6-14. Call the Winter Sports School at 800-SKI-NUBS for more details. Jan. 12 – Ski Academy Saturday afternoon sessions begin for ages 6 – 14 from 2 – 4 PM. Call the Winter Sports School at 800-SKI-NUBS for more details. Jan. 22- Petoskey Middle School ski meet begins at 4 PM. Jan. 26 – Harbor Springs Ski Team invitational. Slalom on Smokey 5 PM. Feb. 1 – Harbor Springs Ski Team will host an LMC ski meet. Meet begins at 5 p.m. on Smokey and Valley. Feb. 9 – Enjoy entertainer Patrick Ryan in Nub’s Pub from 3 to 6 PM. Feb. 12- Region 4 Division II Ski meet hosted by Petoskey and Harbor Springs on Scarface, Smokey and Valley. Feb. 12- Petoskey Middle School ski meet begins at 4 PM. Feb. 16 – Enjoy entertainer Pete Kehoe in Nub’s Pub from 3 to 6 PM. March 2 – Enjoy entertainer Patrick Ryan in Nub’s Pub from 3 to 6 PM. March 18 – Late Season Spring Discount Period Begins: Come enjoy the best in Michigan spring skiing & snowboarding at reduced rates through the end of the season. March 23 – Mardi Gras: Our annual family orientated Spring Fling with fun and games for all. Don’t miss the Soaker Cup, Costume contest, Dorie Sarns Challenge, live music and much more! March 30- The Outfitter of Harbor Springs presents TELE-BRATION! Enjoy telemark demos, a telemark NASTAR division and hang out with all of your free-heel friends. Morel Mushrooms Hunters – Plan to hunt this elusive delicacy from late April through May. Boyne City, Michigan hosts the National Morel Mushroom Festival in May each year. Hamlet Village Condominiums enjoy a central location in prime mushroom country near Harbor Springs. Special rates available for those who want to enjoy Spring in a woodland environment. Call Land Masters/Hamlet Village Condominiums at 800-678-2341 for details. Zoo-De-Mack – May – Bike ride to enjoy the beautiful scenery in Northern Michigan. The ride is approximately 51 miles on paved roads and starts out on a Saturday morning at Boyne Highlands (approx. 3/4 mile from Hamlet Village). You’ll enjoy spectacular views of the countryside, forests and views of Lake Michigan from the bluffs. About half way, bikers stop at unique Legs Inn in Cross Village for a leisurely lunch and to swap stories, then continue on to Mackinaw City to the finish line. Call Land Masters/Hamlet Village Condominiums at 800-678-2341 to book your reservation. Memorial Day Weekend – Plan to join us and Stay 2 nights and receive 1 night FREE! Celebrate Memorial Day Weekend with nearby parades and memorials in relaxed small town settings. FESTIVAL ON THE BAY – August in Petoskey. Weekend specials will include musical entertainment, a children’s area with fun activities and a petting zoo, a Silent Disco, Cardboard Boat Race, Waganakasing Bay Day, The Big Art Show, and more…fun for the entire family! Check out petoskeyfestival.com for more information. Call Land Masters/Hamlet Village Condominiums at 800-678-2341 for rental reservations. MIDWEEK 5 NIGHT SPECIALS – 5 Nights, Sunday thru Thursday, (excepting Holidays). Call Land Masters/Hamlet Village Condominiums at 800-678-2341 for details. Plan to join us and Stay 2 nights and receive 1 night FREE! Celebrate Labor Day Weekend with parades, festivities and fireworks in a relaxed small town setting. 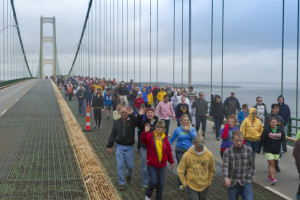 Walk the famous Mackinac Bridge, enjoy a picnic on the beach, cruise the Inland Waterway and so much more! Northern Michigan offers fun for the whole family, so call 800-678-2341 or email rental@landmasters.com to reserve today! Check out our rental options! Looking for unique items for souvenirs or gift giving? Enjoy browsing through the many fine downtown shoppes in Harbor Springs and Petoskey while staying at Hamlet Village Condominiums. Our Northern Michigan area offers fine restaurants with many varieties of cuisine palatable to your taste buds and pocketbook! Both Harbor Springs and Petoskey offer many choices ranging from fast food, burgers, pizza, ice cream parlors to full course dinners and fine dining.